You may yawn at yet another how-to-write coming out but this one is different. For a start it's written by two authors who really know how to write and have been in the industry for years and years. They have written many short stories and novels. Between them they have two Bram Stoker awards, two World Fantasy Awards, two British Fantasy Awards, one International Horror Guild award amongst others. The authors I'm talking about are husband and wife, Steve and Melanie Tem. 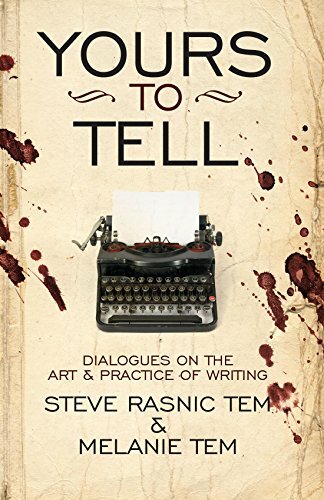 I really felt whilst reading this book is that the reader gets a really intimate and rare insight into how two very prolific and successful authors go about their craft. 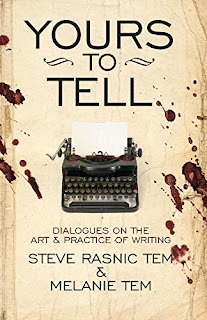 Yours to Tell is divided into chapters which cover all aspects of writing, such as plot, characters, setting, point of view, structure as well as chapters that deal with engaging their readers. So, in short it covers a lot of ground and pretty hefty 227 pages long. The book is written in a conversational tone which is easy to read and informal, they have been teaching pupils to write for years and this book reflects what they taught in those years. What I liked about this book is that you don't have to read the book cover to cover. You can start with whatever chapter you want and read in your own preferred order. This book is packed full with really simple advice, to importance of following your own path in writing. They've given me lots of new methods to try out with my own writing and is full of practical advice. One little gem I will share with you is how to move a story along and stop your readers from getting bored. The tip they shared actually comes from South Park creators, Trey Parker and Matt Stone. When coming up with new episodes for their South Park series, they plot by theoretically inserting a "therefore" between each scene rather than an "and". This happens therefore that happens. This helps them to ensure the story is constantly moving forwards. To create tension and conflict they also throw in a few "buts." Which is definitely a method I will be using to check against my own work. Yous to Tell is a book that I will definitely be reading again. There's also a recommended reading list added at the back including creative writing handbooks and great fiction!